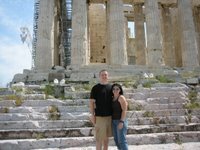 We’ve experienced a bit of a culture shock after having traveled from Italy into Greece. In Italy it seemed like every Italian owned a well-trained, beautifully groomed dog that they brought with them everywhere they went. Most shops and restaurants don’t even bat an eye when a patron walks in with a puppy companion and neither do the other customers. 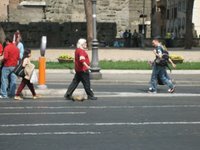 Italians will even bring their dogs with them on the subway and buses, and you’d be amazed at how well-behaved the dogs act. 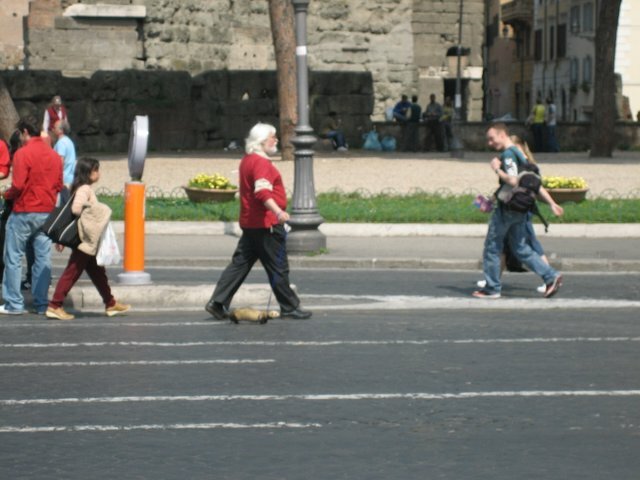 We even saw one guy who had a ferret with him. Some people just gotta be different. Today while walking around Athens we saw dogs all over the place, but unlike Italy these dogs wander free and roam in packs. They’re scruffy and dubious and they’re around every corner. Some of them look up at you with eyes that plead with you to take them home which breaks your heart, and yet others are frighteningly feral and you cross the street simply to avoid crossing their path. Oddly, over half the wild dogs we’ve seen wear collars. It’s very sad. No pictures of them”¦I could barely look at them without tearing up much less shoot photos. On a lighter note, we visited the Acropolis today. You know the image even if you don’t know the name. 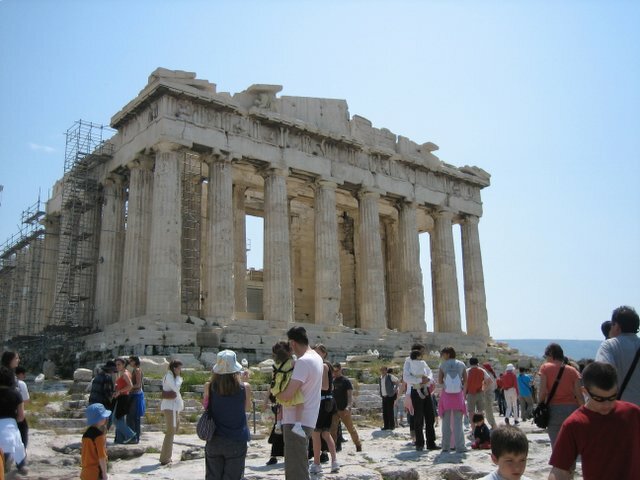 Atop the Acropolis you’ll find one of the most famous temples in the world, the Parthenon. According to our guide book people have worshipped here since 5,000 B.C. 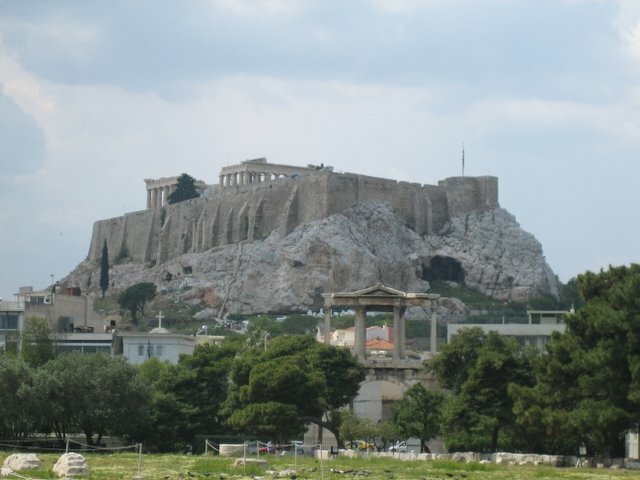 During the golden age of Greece over 250,000 Greeks worshipped here, and the areas encircling the Parthenon and the Acropolis became the cultural center for the known world. The Parthenon sits atop the huge rock of the Acropolis where sheer rock walls provide natural protection from invading enemies. Not to say that no one has ever successfully attacked and controlled the Acropolis, but it does make for an imposing image. Unfortunately they forbid climbing the walls”¦sorry, Flood. The sight of the Acropolis from the streets below is an amazing thing”¦then you actually walk up to it and the crowds dispel much of the mystery you felt at the foot of the hill. I can only imagine the number of clamoring tourists which vacation here in the peak months. It’s bad enough now and we’re in an off-season. We visited the Acropolis museum, which houses sculptures and pieces of the Parthenon and surrounding temples that have fallen and need protecting from the elements. Everything they have in that museum is rock of some sort. For centuries it survived outside through the scorching Grecian summers and whatever else mother nature saw fit to throw at them. Ironically, the guards in the museum seem to feel that camera flash poses an insurmountable danger to rocks which survived several millenniums. Not only do they not want you to use your flash, but they also don’t want you to pose in front of any of the exhibits. If you do suddenly decide to strike a pose because you feel there’s nothing to it, then they run at you screaming like banshees “NO POSE; NO POSE.” The guards were far more interesting than the actual exhibits. I took a lot of photos of them, until one of them caught me. I was tempted to yell “NO POSING” at her, but I didn’t. 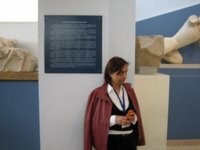 Two weeks ago while at the British Museum we heard that the Greek government wants England to return all the Greek artifacts they currently hold. During the 19th century while the Turks ruled Greece England managed to engage in a very lucrative relationship with the Ottoman Empire. 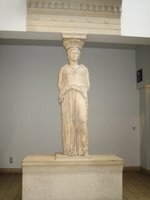 While in Athens Britain’s Lord Elgin took an enormous amount of Grecian artifacts which he donated to the British Museum where they have remained ever since. Since that time Greece gained independence and now wants their stuff back, post-haste. England says no. They claim that the Turks gave them the stuff so if they return it to anyone it will be the Turks. Frankly, I find the argument a little thin. However, after seeing how inefficient the Greeks handle their museums and their archeological sites in general I have to admit that it might be better for posterity if England hangs on to the stuff for a while. For one thing the unreliability of the labor system here makes consistent archeological work unreliable. We’ve already been warned that strikes are so prevalent that if we want to see something to do so immediately, because you never know when the unions will choose to strike. Also, many of the environmental conditions here are detrimental to the integrity of the artifacts. 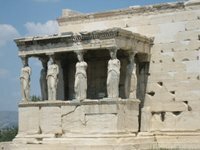 Take for example the Caryatids from the Temple of Athena. They moved the originals inside the museum because the acid in the smog which constantly hovers over Athens eats away the surface of the sculptures. 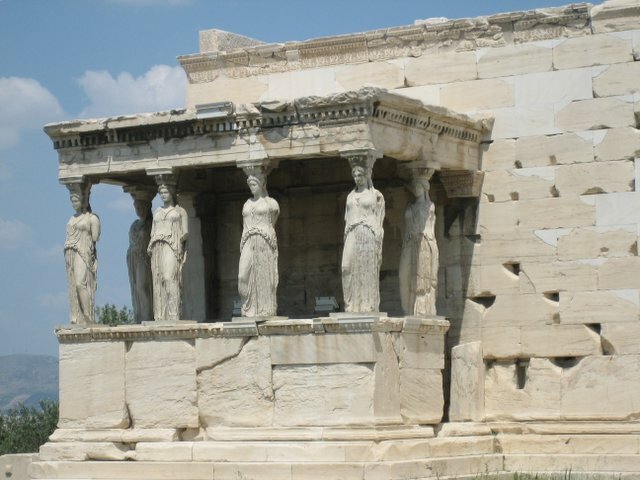 Unfortunately, the Greeks let the smog work the Caryatids over pretty good before they decided to move them inside. 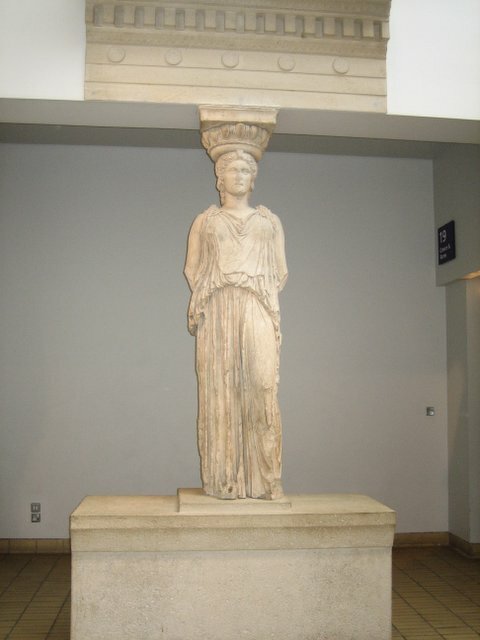 However, Lord Elgin stole one in the 19th century which we saw at the British Museum. It looks brand new because it has remained indoors, thus avoiding all the smog damage the others weathered so poorly. The picture on the left is from the British Museum and the one on the right is from here in Greece. It’s a bit of a conundrum, weighing cultural heritage over the preservation of history for the greater good. I’m glad I don’t have to cast a vote. This is a beautiful city. 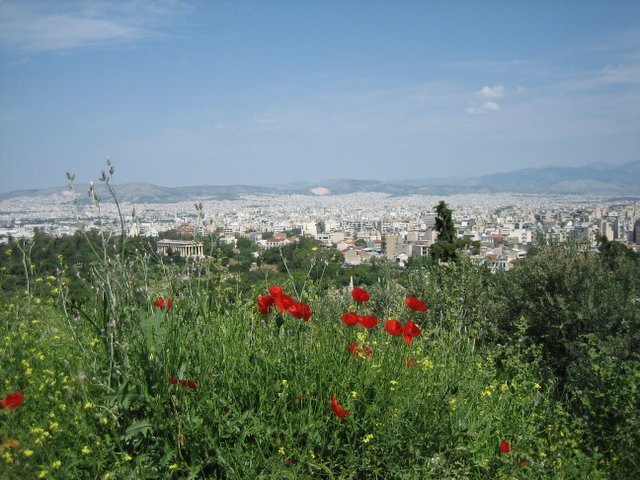 Mountains surround it, and from the height of the Acropolis you can see for miles and miles around. You’re so high up in the air that a cool breeze blows continuously, keeping the whole Acropolis from melting under the gaze of the hot, hot sun. 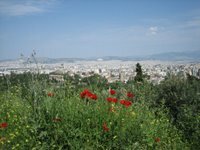 Walk down from the Acropolis into the neighborhoods below and the spicy aromas emanating from all the restaurants assault your senses. And they’re not the pretentious restaurants of Italy either. They’re the type of restaurants where when the juices from your gyro run down your forearms you struggle to lick them off instead of demurely and subtly wiping them off with your napkin. We’ve got some sight-seeing to do here, but our toursity schedule is a lot lighter than in our previous stops. I’m looking forward to eating a lot of gyos and taking it easy. I’ve posted some more pictures on the flickr page, so check’em out. See ya tomorrow.